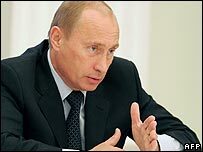 President Vladimir Putin has warned Georgia not to use the "language of provocation and blackmail" against Russia in a speech in parliament. The Duma went on to vote overwhelmingly for a motion echoing Mr Putin's condemnation of "anti-Russian" and "anti-democratic" policies in Tbilisi. Tension rose in the past week when Georgia detained, then released, four Russian army officers for spying. 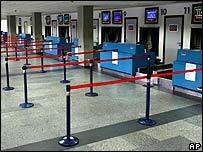 Russia has imposed a travel and postal ban between the two countries. "I would not advise anyone to talk to Russia in the language of provocation and blackmail," Mr Putin said in the Duma. "I am talking about Georgia here." The motion passed by the Duma accuses Georgia of violating human rights and advocates further economic and financial sanctions. There are signs that Russian authorities are targeting Georgians and their businesses, says the BBC's Emma Simpson in Moscow. Two popular casinos, apparently run by Georgians, have been closed down, allegedly for tax evasion. Two Georgian restaurants and a hotel have also been raided. Russian media say that the interior ministry has told the police to take tough actions against Georgian organisations and businesses. The head of the Georgian Society of Russia, Vladimir Khomeriki, accused politicians of going against a long tradition of friendship between the two nations. "Politicians seem to have an interest in pitting our nations against each other," he told Reuters news agency. He argued that as two Orthodox Christian nations, they had historically faced down threats from Muslim neighbours Turkey and Persia (Iran). "Georgia is linked to Russia through common history, faith, culture and centuries-old friendship... and also common economic and geopolitical interests," he said. Russian Defence Minister Sergei Ivanov said Russia could speed up the withdrawal of its troops from Georgia because of the current tensions. "We understand the conditions our servicemen are living in," he said. In a deal signed last year, Russia pledged to withdraw its 3,000-4,000 troops from Georgia by the end of 2008. Moscow has ignored a call from the EU to lift the transport and postal ban imposed on Georgia, and may go even further. One possible new sanction is the adoption of a bill that would prevent Georgians living in Russia from sending money home. Estimates vary but it is believed that at least one million Georgians - both Georgian and Russian citizens - currently live in Russia. Georgia's own population is about five million, and many families depend on remittances sent by relatives from Russia. Russian sanctions could take 1.5% off Georgia's GDP this year, Georgia's minister for economic reforms, Kakha Bendukidze, told Reuters news agency.